After decades of repression, a broader section of Yemenis are now actively and peacefully taking part in Yemen’s transition to a post-revolutionary stage. Civil society has played a crucial role in Yemen since the 2011 uprising, with 20% representation during the 10-month-long National Dialogue Conference that ended in January, the outcome document of which outlines the underlying principles for a new Yemeni Constitution. Yemen still has far to go, as it faces sectarian unrest in the north; militants in the south; mounting assassinations of top intelligence and military officers; attacks on electricity and oil pipelines; and a humanitarian crisis, with more than half of its population of 25 million in need of assistance. However, as the country slowly marches toward political and social reform, continuing to meaningfully engage civil society in decision-making processes affecting national and local policies—particularly given the role that civil society has played in Yemeni society since the 2011 uprisings—is a critical part of any future plan for Yemen’s peaceful transition. Yet, there are worrying signs that civil society is being excluded from critical discussions. The “Friends of Yemen,” an international grouping of 39 donor countries and international organizations dedicated to supporting Yemen’s political transition, held its seventh ministerial level meeting in London on April 29 to discuss mechanisms on how to better assist Yemen in overcoming its challenges. The conference resulted in the establishment of a senior level steering committee and three working groups composed of various states and international organizations focused on economic, security, social reforms, designed to “align support for Yemen with the priorities set at the conclusion of the National Dialogue.” However, unlike previous iterations of the “Friends of Yemen” conferences, local Yemeni civil society organizations (CSOs) were excluded from this meeting in London—instead directed to a World Bank consultancy forum in Washington, DC. Indeed, Yemen is one of the most fragile and poorest countries in the Arab world, with 45% of the population food-insecure and one of the highest population growth rates in the world. Compounding these numbers is the fact that the majority of the population lives in rural areas, impeding the reach and service delivery of a government with weak public service institutions, little control over large parts of territory, lacking in capacity, and plagued by corruption. Amidst this backdrop, civil society in Yemen—now numbering at around 8,300 registered groups—continues to play a vital role in filling the gap between the state and the citizens, and fostering peace and development. More than 120 local organizations work on human development efforts in remote rural areas where government services are absent or beyond the state’s reach. For example, the Al-Wedyan Association for Development of Society based in Aden work on socio-economic and political empowerment of poor and marginalized groups, and the Reach Out Foundation for Human Development addresses socio-economic and health issues in the Al-Hodeida governorate. With many people unable to afford formal judicial institutions that are too far away, too costly, or too lengthy in process, local civil society structural initiatives modeled on customary and tribal practices of mediation and conflict resolution were formed to advance community-based solutions and bring new actors such as youth and women to the forefront of peacebuilding (see here & here). Further, particularly in the south where insecurity is at its highest, controversial popular committees (local groups designed to bring security and stability to a community) have acted when the official government apparatus (either military or police) has not been present. Other CSOs have gone beyond serving only Yemenis, such as the Society for Humanitarian Solidarity, which monitors Yemen’s 2,000 kilometer-long coastline and provides service to refugees who have crossed the Gulf of Aden, fleeing conflict and famine in the Horn of Africa. As Yemen moves forward with its transition, it is clear that civil society is key to keeping the country intact; it can voice and address the needs of many Yemenis, often when the state has not been able to. General observed studies affirm that civil society can play an important role in peacebuilding, though it is primarily in a supportive capacity, and the degree to which it is effective is highly contingent on context. In the case of Yemen, civil society seems to be as well-placed as any other to support the state and the peacebuilding process, through its engagement in protection, monitoring, advocacy, facilitation, and service delivery work. Yemeni and international actors looking to strengthen Yemen’s transition process may wish to consider following through with recommendations of the National Dialogue Conference, including the proposed amendments to the Law on Associations (Law 1 of 2001) that contains obstacles to forming and registering CSOs, as well as the establishment of an independent, national association responsible for overseeing political parties and civil society affairs. As a point of guidance, the United Nations Development Programme released a document in 2013 outlining a potential new partnership framework between the government and the CSOs to build and strengthen cooperation. The World Bank has also emphasized the critical role of civil society in shifting momentum in Yemen, recently announcing an 8 million USD grant project to support civil society in Yemen. The “Friends of Yemen” may also want to engage local CSOs in any future meeting, particularly as the group has yet to release the remaining 64% of the $7.9 billion USD pledged funds promised since its first meeting in Riyadh in 2012. As opposed to focusing “outside of the box” for support and creative problem solving, it may be worth looking further “inside the box” for solutions—working with local actors and building channels of communication and cooperation between CSOs and the government. Instead of risking to devalue a resource that has been historically untapped or underutilized, civil society should be engaged and validated, so that it may more effectively support the building of a stronger, more democratic Yemen. 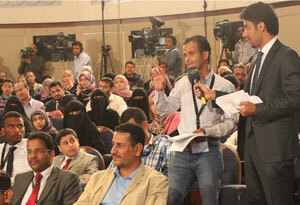 Ultimately, local civil society is most likely to be the greatest friend of Yemen. Waleed Alhariri and Margaret Williams are Research Assistants in the Middle East program at the International Peace Institute.